Resolute Rhetoric: Obama's Confident Case For Government Though wrung of much of the drama of his historic first inauguration, President Obama's efficient, specific and, at times, soaring address outshone his first with allusions to Lincoln, King and Kennedy. Speech experts and presidential historians weigh in on Obama's words and delivery. 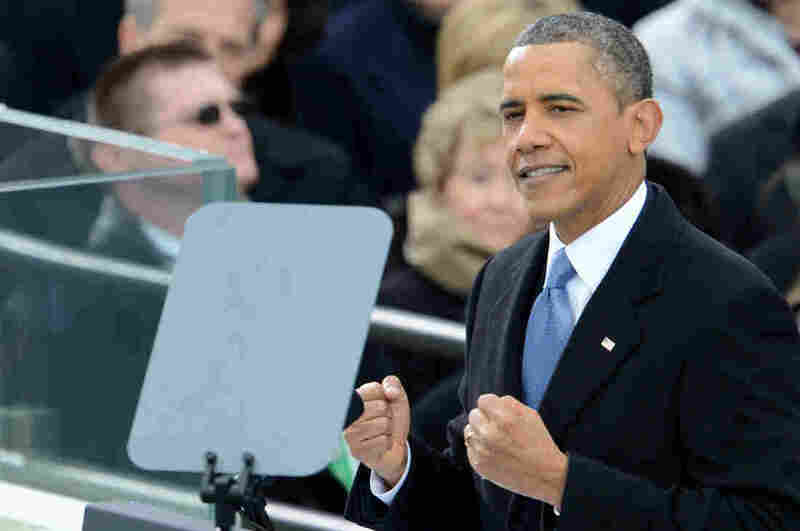 President Obama delivers his second inaugural address Monday in Washington. President Barack Hussein Obama, sobered but resolute after four years as the nation's first African-American head of state, began his second term Monday with an ardent defense of government as essential to the nation's economic and moral fiber, and a call to citizens to accept their obligation to shape the national debate. "Today we continue a never-ending journey," he said, "to bridge the meaning of those words with the realities of our time." It was a far different man than the Obama who took the presidential oath on a frigid day in 2009 with nearly 2 million people packing the National Mall. The crowd Monday on the national holiday honoring late civil rights leader the Rev. Martin Luther King Jr., though massive, was less than half that. And those gathered under a clouded sky saw a president scarred by pitched, partisan battles and humbled by tragedies like the recent school massacre in Connecticut. Though wrung of much of the drama of his historic first inauguration, Obama's efficient, specific and, at times, soaring address outshone his first with allusions to Lincoln, King and Kennedy, and commitments to the middle class, to equal rights for women and gay Americans, to action on climate change and immigration. Four years ago, perhaps steeling himself, and American citizens, for coming economic hardship more formidable than even he realized at the time, Obama delivered a pragmatic, almost generic, speech that called for a "new era of responsibility" and took little note of the history he was making. What the crowd saw Monday was a now-tested leader empowered by a second-term win and the freedom that comes with never having to face another election. That assurance was reflected in his address, with coming-together themes pulled from his early pre-White House campaign speeches, and echoes of the fair shot for all, rich or poor, rhetoric that marked his recent winning campaign against Republican Mitt Romney. Don Baer, a former Clinton administration speechwriter, saw the address, with its precise agenda, as a "no-nonsense fusion" of an inauguration address and a State of the Union speech. "It was also a pretty blunt and direct message to his domestic political opponents, and a clear indication of what his presidential intentions are," said Baer, who worked on Clinton's second inaugual speech. "The president is pressing his political power, saying, 'Look, I won the election and I'm not going to mess around.' "
The speech may have been lacking in specific sound bites, says Fred Shapiro, editor of the Yale Book of Quotations, but it served up an "eloquence of evocativeness and overall tone." "Four years ago I expected that he would echo Lincoln and Franklin Delano Roosevelt and John F. Kennedy and Martin Luther King Jr. and was surprised that he did not," Shapiro said. "This second inaugural address was full of evocations and explicit references" to those men. It was a speech, Shapiro said, that was "enveloped in allusions to the fundamental texts of American government." Obama, like Lincoln in his Gettysburg Address, notably reached further back in history than the U.S. Constitution, choosing to hang his theme on the earlier Declaration of Independence and its clear invocation of unalienable rights. It was the Constitution, after all, that asserted that slaves would count for three-fifths of a person and that until 1920 denied women the right to vote. What was most striking, however, to historians and former presidential speechwriters was Obama's defense of government programs that build bridges and railroads, that ensure, he said, competitive and fair free markets, and that provide a "measure of security and dignity" to the nation's old, its needy, and those rocked by misfortune. It was a speech, says presidential historian Russell Riley, that pivoted directly from President Ronald Reagan's 1981 inaugural address when he asserted that "government is not the solution to our problem; government is the problem," as well as from President Bill Clinton's 1996 "the era of big government is over" State of the Union remarks. The rhetoric was conducted at a fairly high plane, and it wasn't soaring, empty rhetoric." "What President Obama was doing, in an elegant way, was making an argument for why we have government in the first place, and why it has to be there to solve the problems of the modern era," said Riley, who heads the presidential oral history program at the University of Virginia's Miller Center. "The rhetoric was conducted at a fairly high plane, and it wasn't soaring, empty rhetoric — and that's what I found very interesting," he said. This is a president, Riley said, who did not overtly lay claim that the era of government has returned but, in an indirect way, used the ground laid by the nation's forebears as an argument to make aggressive use of his office to protect programs that he sees as advancing the ideals embodied by "we the people" in the Declaration of Independence. A direct line, Baer says, can be drawn from Reagan to Clinton — including Clinton's second inaugural speech when he proclaimed government neither the problem nor the solution — to Obama's "strong embrace of the role of government." If Obama, and the nation, have learned anything during his first term, it's that a "post-racial" unification of a red and blue America into the United States of America has always been, and remains, a dream deferred. After his first White House win, Obama benefited for two years from a Democratic hold on both the U.S. House and Senate, leading to a flurry of early action including the passage of health care legislation. The Republican takeover of the House in 2010, fueled by the rise of the Tea Party, has turned governing — even on the most basic of issues — into a series of acts of futility and embarrassment. Obama, the 51-year-old son of a black Kenyan father and white mother from Kansas, acknowledged the stark reality of the political divisions that beset the nation as he embarks on his final years in the White House. "We cannot mistake absolutism for principle, or substitute spectacle for politics, or treat name calling as reasoned debate," he said. "We must act, knowing that our work will be imperfect. We must act, knowing that today's victories will be only partial, and it will be up to those who stand here in four years, and 40 years, and 400 years hence to advance the timeless spirit once conferred to us in a spare Philadelphia hall." Baer, the former Clinton speechwriter, saw Obama's speech as perhaps a form of triangulation, hitting on three themes: unity, equality and immediate action. "He came to the day," Baer says, "prepared to start governing right now." Obama's words in defense of government, and its role in spheres including health care, the economy and immigration, are likely to complicate the politics of looming debates on the budget and the "fiscal cliff." While rousing his supporters, the sharpening of distinctions between his view and that of GOP House Speaker John Boehner, for example, "will resonate in debates to come," says Riley, of the Miller Center. Obama did not shy from the collision. "For we, the people, understand that our country cannot succeed when a shrinking few do very well, and a growing many barely make it," he said. "We are true to our creed when a little girl born into the bleakest poverty knows that she has the same chance to success as anybody else, because she is an American, she is free, and she is equal, not just in the eyes of God but also in our own." Inauguration speeches have been referred to as a great sacrament of democracy, a time to speak to Americans gathered on the National Mall and in front of television screens across the nation, and to the wider world watching the leader of the free world. Obama touched little on the issues of that wider world and focused on what Shapiro characterized as a bolder and more explicitly liberal agenda for his second term. "This was not a speech about reaching across the aisle and compromising," he said. "It was a speech about forcefully advocating the rights of women and gays and immigrants" while not shying from controversial issues like voter suppression, and the GOP critique of "takers." Riley, the historian, saw it as a lesson in political science, the kind of speech his supporters have been waiting for, and upon which his detractors will no doubt pounce. The nation's 44th president, no longer a newbie, no longer a leader of the nation with just two years in the Senate under his belt, appears ready and poised for the fight. "This generation of Americans has been tested by crises that steeled our resolve and proved our resilience," he said. "A decade of war is now ending. An economic recovery has begun. America's possibilities are limitless, for we possess all the qualities that his world without boundaries demands: youth and drive, diversity and openness; and endless capacity for risk, and a gift for reinvention."